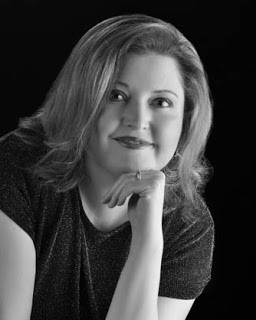 Two Chicks On Books: Blog Tour: REUNITED by Colleen Houck An Interview & Giveaway! 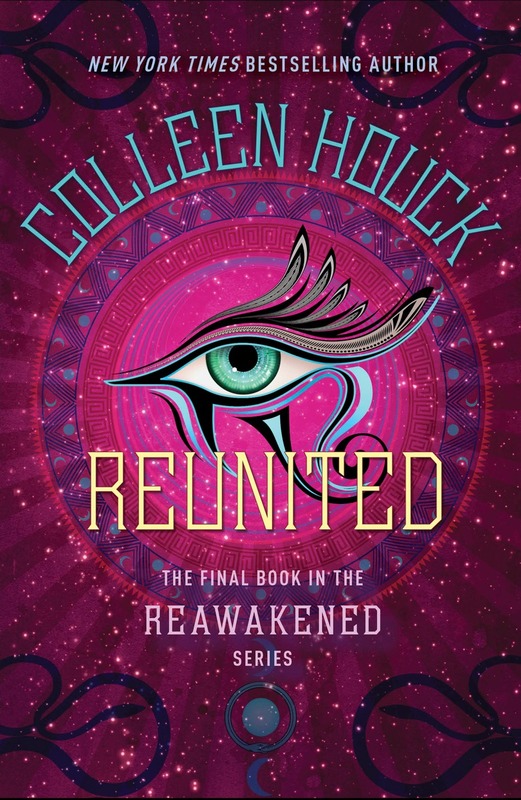 Blog Tour: REUNITED by Colleen Houck An Interview & Giveaway! Hey everyone! 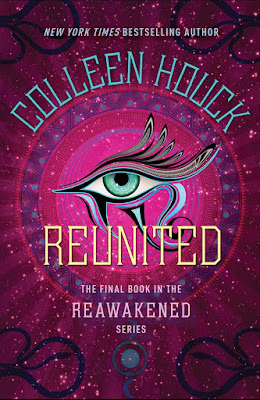 I am thrilled to be hosting a spot on the blog tour for REUNITED by Colleen Houck! I freaking love this series and this finale was the perfect ending! I have an interview with Colleen to share with you today! And make sure to enter the giveaway below! Haven't heard of REUNITED? Check it out! Hi Colleen! First I want to say welcome back to Two Chicks on Books! REUNITED was absolutely fantastic and I can’t wait for everyone to read it! And am so happy that you could stop by for a visit! For the readers: can you give us a little recap of the REAWAKENED series and the characters? The Reawakened series has the number three as a theme. This was based off of the pyramids and the triangle, so we have three girls, three princes, and three villains, plus assorted gods and goddesses. Lily is my main character. She’s a New Yorker who got swept up in an Egyptian, mummy filled adventure when she stumbled across newly awakened Amon, in the Metropolitan Museum of Art. They fight an evil necromancer in Reawakened, with the help of an archeologist named Doctor Hassan. We also meet two more mummies in this book, they are Amon’s brothers from other mothers, Asten and Ahmose. Together their job is to align the sun the moon and the stars and they each embody and carry the power of one of those celestial bodies. In Recreated, Lily meets several of the Egyptian gods, learns the origins of the cosmos, and travels to the Netherworld to rescue Amon from the clutches of the Devourer, an evil queen of the dead who eats hearts. Not only do we get to know Isis, Nephthys, Anubis, Amun-Ra, and Ma’at, but we meet two more characters, Tia, a feisty lioness, and Ashleigh, a fairy trapped in the Netherworld. With the help of other creatures they meet along the way, they manage to rescue Amon, but things don’t exactly return to normal for Lily, and that’s where we begin book three, Reunited. I know this isn’t your first series finale but how was it writing this finale was it different from your other series? And what are you working on now? Reunited actually was my first finale (I just finished Tiger’s Dream this February). This one was easier since the series was smaller. There were a lot of loose ends to tie up in the tiger series. Right now I’m working on a book set to release in the fall of 2018. I can’t say much about it at this time since we haven’t announced it yet but this will be my first book with a blond hero. I use the names of my ancestors as well as my nieces and nephews. My fairy, Ashleigh, is named after my newest niece, Ashley. They complain when they can’t all be fairies or mermaids or vampires. In the Reawakened series, Nana, Lily’s grandmother, is based on my great grandmother. The farm animals are even named after my maternal grandmother’s farm animals. Nana’s twin brothers Melvin and Marvin are based on my identical twin uncles, Norman and Delman. My grandfather and brother are named Melvin, too. I love Tia. Getting into the head of a lioness was so cool. There is a goddess in Reunited that I had a more difficult time with. Thankfully, she doesn’t spend a great deal of time on the page. She’s a bit inhuman, literally, so it’s harder to identify with her. What is your favorite passage/scene in REUNITED? Hands down, the spider. You’ll have to wait till you meet her. She’s pretty cool. In this one, I spent some time researching African mythology. There is plenty of Egyptian to pull from but I wanted something different that wouldn’t be as easily recognized. My spider came from that. I really like Rhett Butler, but he’s a bit old school, so for YA it has to be Edward Cullen. Speaking of which, Stephenie Meyer was the one who inspired me to write. When I read about how a stay-at-home mom just got up and wrote a book, I realized it didn’t matter how old you are. If you have a desire to write, then you should. I am very active on Goodreads. Right now I’m reading everything by Kiersten White since she’s my featured author of the month. I really want to pick up Wintersong by S. Jae-Jones. Labyrinth was one of my favorite movies when I was young and, in fact, one of the scenes in my book was based on a scene in the film. Can’t wait to read about the Goblin King. Probably Hufflepuff but I’d rather be Ravenclaw. Eyes. I hate when people touch their eyes. Nothing new. I can always rock out to classic Michael Jackson. Thanks so much Colleen for answering my questions! I can’t wait for everyone to read REUNITED! 3 winners will receive a finished copy of REUNITED, US Only. Go back to where it all began! Grab the first books in the series and the companion novel! I would absolutely love to read this series. I haven't read you before but this sounds like a fun read. Love your quick answers. I'm dying for Thor too ;).